March | 2018 | Nicholas Hoffman & Co.
All football fans know that “second and ten” refers to the second down in a football game where a team still has ten yards to go to gain another first down. Irrespective of the field position of the ball, second and ten offers a reasonable chance of progressing down the field. Of course second and one would be better, but fourth and thirty is a lot worse. In the bond market we also refer to twos and tens albeit in a quite different way. “Twos” are Treasury notes that have 2 years until maturity, and “tens” are Treasury notes that have 10 years until maturity. Not only do we observe the level of each maturity, we also monitor the difference between the rates on each maturity, which is known as the “spread” or “slope”. An increase in the difference is referred to as a “steepening” yield curve, and a decrease is known as a “flattening” yield curve. The rate for twos is driven by many factors, but is heavily dependent on expectations of short term Fed policy. The rate for tens is driven by a broader set of longer term issues, including inflation, supply/issuance, corporate bond market activity, relative attractiveness versus other assets, and the behavior of foreign buyers. The spread between twos and tens (or short term rates and long term rates) can be just as important as the level for each. The table shows that, since December 2016, the spread has steadily and consistently declined from 1.27% to 0.58%. It is noteworthy that the current lower spread is at a time when short term rates are expected to increase twice more in 2018, with two to three further hikes in 2019. If these expectations are realized. the Fed Funds Rate will rise to approximately 2.75%, which is close to the current 10 year rate. A higher spread, or steep yield curve, has often preceded an economic upturn. A flat yield curve frequently signals an economic slowdown. An inverted spread, when long term rates are lower than short term rates, can be a harbinger of recession. Of course yield curve levels and spread are just a rough indicator of what might happen next, just as second and ten in football provides a rough guide to the chance of field progress. Nevertheless, yield curves are a key part of any evaluation of the entire field position of the markets and the economy. 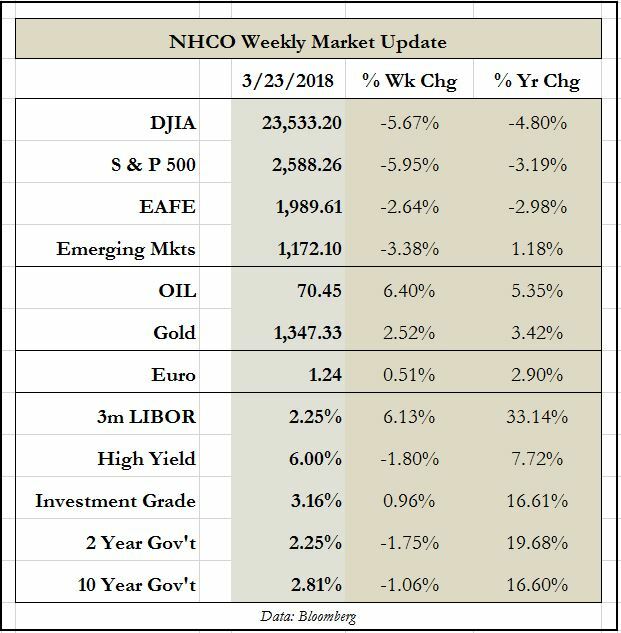 This entry was posted in The Weekly on March 26, 2018 by nhoffmanandco.